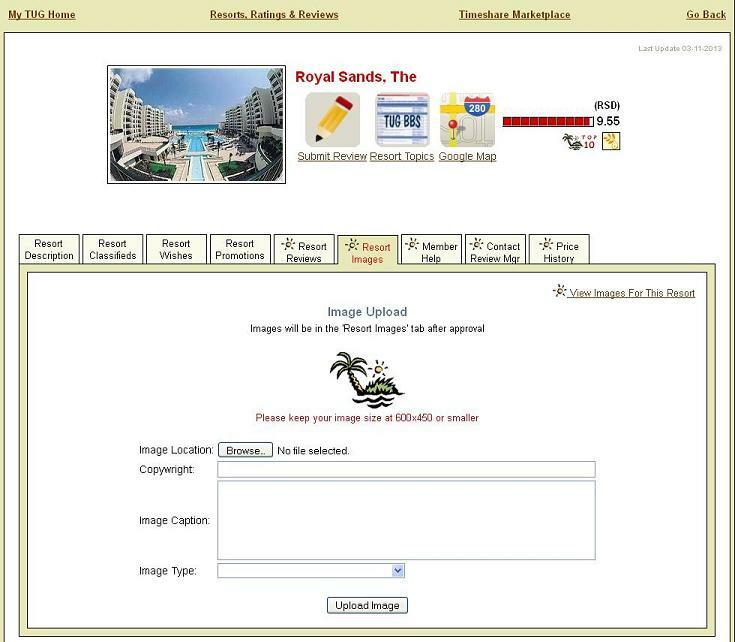 This page describes how to add your own Timeshare Photos to the TUG Resort Database! While everyone is likely aware that there are tens of thousands of Photographs of Timeshare Resorts stored in the TUG Resort Database, many are unaware that you can upload your own to be listed right on the Resort Review page very easily! Where do I see all the Photos on TUG? Ok got it, now how do I get my pictures there? On the Right hand side of the Resort Images tab you will see a link titled "Upload an Image for this Resort". Clicking that link will bring you to a simple upload page that allows you to upload your pictures directly to the TUG Resort database, directly onto this resort page! Please note that all images do go into an approval queue before being published on the site! There is also a size limit of 600x450 and 2megabytes of size. If your images are larger than this, you can use this quick and easy process to shrink your photograph down for uploading! I notice some very old images on the site for my Resort? Clicking this link allows you to send a notification directly to the Resort Review Manager who maintains this Resort Review page, informing them of any change or update needed on the page...including removing old images as applicable! Please note that this particular link is open to the general public, you do not need to be a TUG member to send a note to the Review manager if you notice something needs updating on the Resort Review page itself. Thus if you are an employee of the resort in question, or member of the HOA/BOD etc, feel free to let us know how we can improve the Resort Review page of your Timeshare Resorts! So where do the Images on Classifieds come from? The default image for each resort will display on each Classified Ad for that Resort, it is supplied automatically from the TUG Resort Image Database. The Default image is awful though? In some cases the default image may be of something obscure or old/outdated, please use the links above to let us know if the Default Image should be changed (or better yet upload a new picture that you feel should be the new default image!) and we can get it updated ASAP! 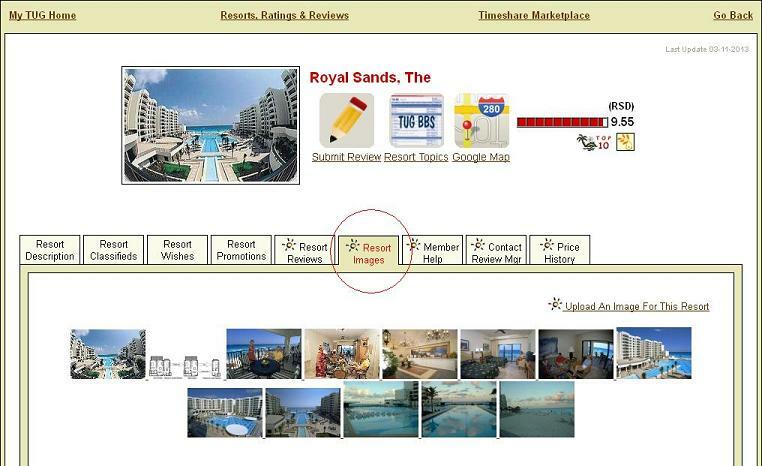 We hope this article helps anyone who is doing research on a Timeshare company! Feel free to stop by our Timeshare Community Forums if you want to ask specific questions, with more than 65,000 other Timeshare owners and experts, no question goes unanswered!